As some of you may know, I’m not what one would call a chocoholic. Not even close. I mean, I like chocolate and from time to time I enjoy eating a bite here and there, but generally I never crave chocolate. What I do crave is SPICY. Give me anything spicy and I am one happy hommie. It was my love of spice that inspired this particular recipe and, omg, was it ever a good idea! 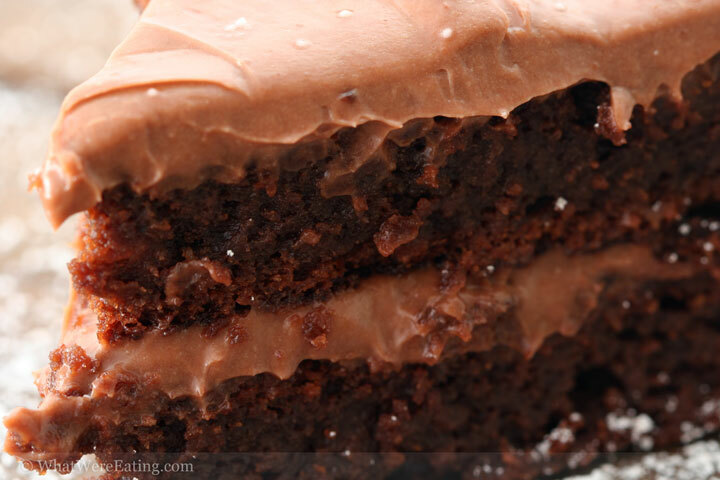 We’re eating super moist & spicy chipotle chocolate cake with a nutella cream cheese frosting. The frosting on this cake is the perfect soothing creamy element needed to round out such a spicy dessert. Preheat oven to 325 degrees. Grease and flour two 8 inch cake pans. Line the bottom of the pans with parchment. Set aside. Place butter into a saucepan over medium heat. Melt the butter, stirring occasionally. Do not brown. Once the butter has completely melted, add the chocolate chips. Stir over medium heat until all chocolate has melted. Do not burn chocolate. Remove from heat. While the butter and chocolate are melting, add the eggs, brown and granulated sugars to a large mixing bowl. Beat until the sugar has completely dissolved into the eggs and the mixture begins to thicken. In a separate bowl, sift together the salt, flour, baking powder & chipotle chile powder. Add the sifted ingredients to the egg mixture. Fold the flour in until just incorporated. Slowly pour the melted chocolate-butter mixture into the batter, folding while pouring to incorporate. Once the all the ingredients have been completely incorporated, pour half of the batter into each of the two greased, lined cake pans. Place the pans into the upper third of a preheated 325 degree oven. Bake at 325 for 25-30 minutes until the cake has just set and a toothpick stuck into the middle of the cake comes out with only a few moist crumbs. (If it comes out with any gooey batter, let the cake bake longer, as needed.) Remove the cakes from the oven and place on a wire rack to cool. Cool for at least 2 hours before building the cake. Once cooled, cakes may be covered and stored at room temperature for a day before finishing. Add the cream cheese and nutella into a large mixing bowl. Beat with an electric beat or cream with a rubber spatula until light and fluffy. Sift in the cocoa powder and powdered sugar. Add the milk then then gently beat to incorporate, trying not to splatter milk and powdered ingredients all over the kitchen! Beat until all ingredients are fully incorporated and the frosting is light and fluffy. Cover and set aside until ready to frost the cake. When ready to assemble the cake, slide a knife around the outside of the cakes to loosen. Place your choice of serving dish upside down over one of the cake pans. Flip the cake pan over (so the serving dish is underneath the cake, right side up) and gently turn out the cake from the pan. Carefully peel away the parchment paper. Using strips of parchment paper, line the base of the cake, tucking strips of parchment just underneath the base all the way around. Place 1/3 of the frosting on to the middle of the cake. Spread the frosting in an even layer over the cake. Carefully remove the second cake from the pan and gently place cake, parchment side up, onto the frosted layer. Peel the parchment paper off of the top layer. Evenly frost the top and sides of the cake using the rest of the frosting. Once The cake is fully frosted remove the parchment strips lining the base of the cake. Serve and enjoy! The cake may be stored, covered, at room temperature for up to 3 days. For longer storage, refrigerate. I get it… looks pretty good to me. I recently did a Spicy Chipotle Brownie so I know how well this combo works! This cake was super delicious! I was one of the lucky ones that got to sample it! And I LOVED the frosting! What a brilliant combination! I’m with you–I prefer spicy to chocolate, though if I am choosing candy I stick to something chocolate-y, while my husband goes for sour/fruity candy. Go figure. The cake picture is mouth-watering! So this is totally the sort of dessert I would TALK about making, but would never actually have the balls to do. It is not that I don’t want to eat it–I sufficiently drooled all over my keyboard and started a minor electrical issue over the pictures, thank you very much. But I never feel comfortable enough to make gutsy combinations like chipotle and chocolate, or even savory sorbets. Thanks for rocking my world a bit! The first time I ate a chocolate cake with chili was at a Spanish restaurant in Taos. I was so blown away, I ordered a second slice. I’ve been following this blog for close to a year now, this is the first thing that I’ve seen that I just had to make… totally worth it. Although chocolate and chili have been all the rage for a while, this is the first time I see the combination being used in a cake. Wowza! Oh! I love the combination of chocolate and chili!!!! Have been looking for a good recipe for years!!! (I tried a few but they were only mehh). I got to try this. This is really an awesome find for me because I’m not only a food lover but also a chef – in short a “cook” (although not that expert lol). And yes, I love chocolates. As a matter of fact I compile chocolate recipes – this one included. Well, I finally made good on my threat to try out this cake recipe, Amanda. And I had the perfect summer venue yesterday: a bar b q grill-off in our back yard. I was a little concerned initially, I have to admit. As I looked at the dense, gooey batter before pouring it in the pans, I was just sure I’d done something wrong. But I pushed on and it turned out to bake up nicely. As the guests began to arrive, I still had the cakes set out on the table cooling and nearly everyone asked what these chocolate-y looking discs were supposed to be. When I finally snuck away from the bar b q grills outside to come in and make the icing, I had already enjoyed much sun, beer and grilled foods. But the directions were all so straight forward (yet so rich), that I was able to whip it up and ice the cake pretty quickly. Long-ish story short: When it had finally gotten dark and people were coming out of the meat-induced food comas, the cake was passed around and people were quickly groaning with pleasure. With big cold classes of milk, that rich and spicy chocolate was a total hit. Thanks so much, my dear friend—and keep up the great work! Instead of the chipotle chile powder, I used pureed adobo chiles and also used Lindt Chili Chocolate instead of the semi-sweet choc chips. My friends and I thought we’d died and gone to heaven when we ate this cake….About to make it again for the 4th of July…. I just came across this while stumbling…absolutely amazing!!! Have it bookmarked! Ok, I was working on this cake when I noticed that the recipe lists 5 eggs with only 3/8ths of a cup of flour?! That doesn’t make any sense. That is a recipe for disaster rather than a tasty cake. actually, “egg to flour ratio”, some of the best chocolate cakes in the world are flourless cakes. don’t be afraid of the small amount of flour – this just makes it a super fudgy delicious dessert. finish the cake then come back and report on the outcome. I did. It came out as hard as a brick and it tasted like eggs. Is it egg whites instead of 5 egg yolks? Maybe I did something wrong? no, it should be whole eggs. not just yolks or whites. what size eggs did you use? if your eggs are “extra large” that could effect the flavor. also, over-beating and over-cooking are what will lead to it being hard. the eggs shouldn’t have any effect on that. i’m sorry you didn’t have much luck with it! I tasted this combination in cupcakes I purchased through a bake sale. Delicious! I tried this recipe & had concerns. I couldn’t find my cake pans so used a bundt pan instead. After about 50 minutes in oven the top was getting a bit crunchy but the inside was still really gooey. I did let the electric mixer beat the eggs for a quite a long time too which probably didn’t help. The bundt cake ended up sinking, but with enough frosting it just looked like a short cake. The flavors were great together & while it didn’t look the best, we ate every bite. Would more flour help this recipe? Have you ever tried it in a bundt pan? Just curious. This was an excellent cake. It has a moist brownie-like consistency with a hot smokey aftertaste. A half-recipe of the frosting (without the milk) was sufficient. The cake was very popular and paired well with cinnamon ice cream. Thanks for the recipe! i’ve made it, but without the frosting – it was still lovely. We had it as it was my turn to make the cake at work and it went down a treat! thanks for a great recipe! I halved this recipe and made then into little baby cupcakes just ’cause and WOW. these are SO amazing – if any of you are on the fence on making these.. you must! they come out so fudgy and chocolaty it reminded me more of a brownie, well, a cakey fudgy delicious thing. and the frosting.. ohhhhh yumm. I baked this for a Halloween party recently and OMG, what an extraordinary dessert and what a hit at the party! I took the quarter of the cake that was left to work the next day (to get it out of my house and away from my mouth) and got more rave reviews. I, too, love the combo of Chili and Chocolate and have adored those Chuao Spicy Maya Chocolate/Chili bars that you can buy at Whole Foods (or at the Chuao Chocolatier at UTC Mall) for years! Made *3* of these cakes for my husband’s birthday. He’s a serious spice fan. They turned out excellently and everyone loved them! I made the layers the day before, triple wrapped them in plastic and froze them. This made them really easy to deal with the next day for frosting. I am a culinary student graduating this May, and for a project we are told to design and make a dessert and serve it to our restaurant that we have on campus. I was a little torn between trying this cake and the Earl Grey cake, but I decided to try this and add a little spin on it. I am making it later this week, and I am going to do mini cakes. I am going to add a lime frosting to the cakes, and a chocolate ganache drizzed down the frosted cakes. Hopefully this project will go over well and the guests at the restaurant will enjoy it… I will definitely let you know how it ended up! The reviews seem great, and this seems like exactly the cake to serve to guests at the restaurant. I’ve made this a ton of times – and it only tastes better and better. it was so easy to make – the frosting.. is sickening it’s so effing delicious. I couldn’t believe that I was possible of producing such a heavenly thing. if you’re on the fence on making this – get the eff off and into the kitchen. it’s so GOOD. I wanted to share that I make this cake regularly in my small bakery I own. All my desserts are made from scratch and I love to push the limits with combinations of ingredients. I came across this cake last year and made it for my customers to try. I used bittersweet chocolate instead of semisweet and I added 1 tsp of Saigon Cinnamon. Also I am known for large grand cakes so I doubled the recipe in order to come close to the height of my other cakes. The first time I made it I gave more pices away than I sold just to get folks to try it. It was received with so much praise that now I have a list of folks I call when I make it. I call it Mexican Fire Cake! Thank you for a wonderful recipe that is easy to adapt for my needs and taste like heaven on a plate! Was wondering how spicy it is? I like just a little kick but not really spicy (mild salsa is the most I can handle.) Should I halve or maybe quarter the amount of chili powder or maybe use a different kind? Thanks!